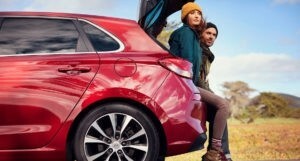 The all-new Elantra GT is the latest member to join the Elantra family. This sporty hatchback was designed in Europe and fine-tuned on the infamous Nürburgring race circuit in Germany. Experience precise and responsive handling for a rewarding drive on your daily commute, weekend adventures, and everything else in between. A stylish and energy efficient lighting system, the available full LED headlights cast a significantly brighter and longer light beam while boasting an unmistakable bold look. High Beam Assist provides an extra level of convenience, with a front camera that continuously monitors traffic and lighting conditions to automatically turn high beams on or off. The 2018 Elantra GT features standard 16” alloy wheels with a two-tone 10-spoke design. The Sport model features standard 18” alloy wheels with larger brakes for sportier driving dynamics. 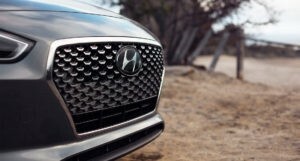 The form and detail of the newly developed Hyundai grille is inspired by the flowing descent of molten steel. It creates a powerful impression of both strength and movement. 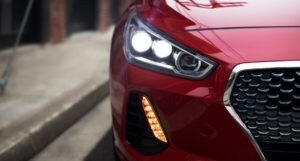 Standard LED Daytime Running Lights not only create an unmistakable presence on any street, they also help make the 2018 Elantra GT more visible to oncoming traffic. The sleek design of the standard LED side repeaters not only look good, but also provide added notification of your intention to turn. 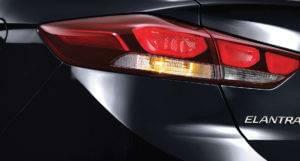 Available LED tail lights wrap around the body of the Elantra GT to enhance its style, and provide increased visibility day and night. The all-new Elantra GT is packaged for Canadian winters. Stay warm with standard heated front seats and a standard heated steering wheel, which is also leather-wrapped and features mounted audio, cruise and Bluetooth® controls. When your journeys take you somewhere warm, enjoy the available ventilated front seats to help cool down. Enjoy the sun, the moon and the stars with the available panoramic sunroof that spans above both front and rear passengers. Clever ergonomics and packaging make room inside for five and so much more. Whether you leave the rear seats up, split-fold them 60/40, or fold them down completely flat – you have storage versatility on your side with the hatchback Elantra GT. 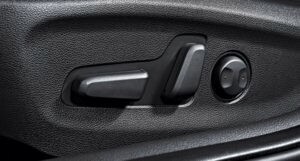 At the press of a button you can initiate/release the parking brake with ease. 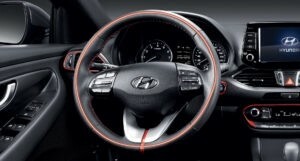 With exclusive red stitching details throughout the cabin, red seat belts, and detailed red piping on the bolstered leather seats, get into the sports-driven style of the Elantra GT Sport model. The unique design of the floating 8.0” touch-screen display is perfectly positioned for both driver and front passenger access. 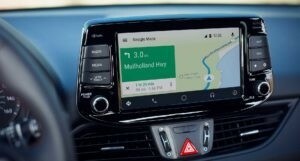 Use it to display your smartphone apps via Android Auto™ or Apple CarPlay™, or access the available navigation system for directions, weather updates and more. 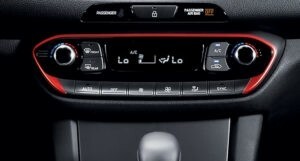 The available dual-zone climate control settings allow both driver and front passenger to select their own climate settings for optimal comfort. By monitoring temperature levels and controlling airflow, the cabin temperature stays exactly where you want it, no effort required. With eight ways to adjust the driver’s seat position, find what is most comfortable for you. The rigid composition of the SUPERSTRUCTURE™ not only delivers enhanced safety, the stronger and stiffer frame means our engineers can tune key suspension components more precisely to enhance handling responsiveness and performance. 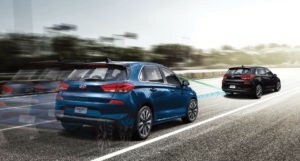 Tested and developed on the infamous Nürburgring race circuit in Germany, the all-new Elantra GT delivers a smooth ride with exceptional shock absorption and high-speed stability. 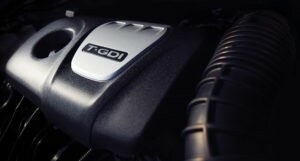 The standard 2.0L Gasoline Direct Injection engine delivers 162 horsepower and 150 lb-ft torque. 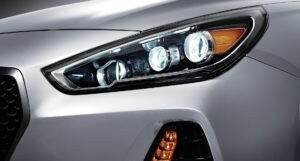 The Sport model is powered by an available 1.6L Turbocharged engine, producing 201 horsepower and 195 lb.-ft. of torque. 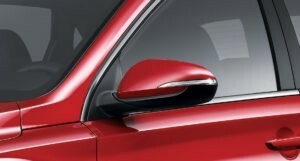 Plus, it’s been outfitted with an independent multi-link rear suspension designed to elevate on-road dynamics and feel. 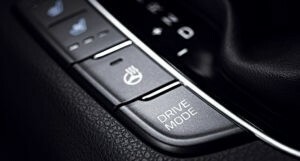 The available Drive Mode Select system adjusts both throttle response and steering effort to match your preferred driving style. 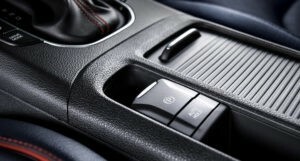 Select from three modes – Eco, Normal or Sport – by simply pressing a button (standard with automatic transmission). 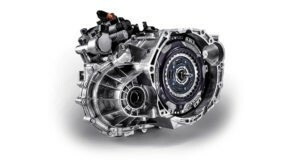 The available 7-speed Dual Clutch Transmission features steering wheel-mounted paddle-shifters and SHIFTRONIC® transmission gear control. 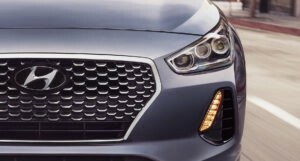 The Elantra GT’s sporty lower front fascia integrates functional front wheel air curtains, which help manage airflow from the front of the vehicle and around the wheels to minimize turbulence and wind resistance. The result is greater fuel efficiency and a smoother ride. 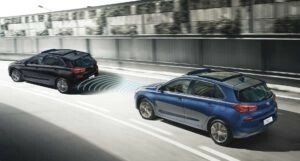 The available Autonomous Emergency Braking with Pedestrian Detection uses a forward camera and radar sensors to detect a rapidly closing distance between your vehicle and the vehicle ahead, or pedestrians in your path, and can even provide full braking assistance under certain speeds. 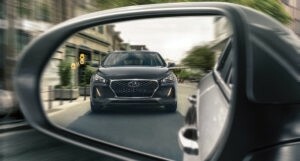 The standard Blind Spot Detection system uses radar to detect when a vehicle is in the driver’s blind spot and provides both an audible and visual alert to help keep you safe as you move down the road. This feature works in conjunction with Lane Change Assist system, which measures the closing speed of traffic approaching in adjacent lanes to help determine if a lane change is safe. 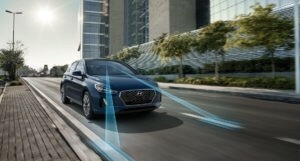 The all-new Elantra GT is the first Hyundai to feature Driver Attention Alert, an innovative safety feature designed to detect the onset of driver fatigue. The system will monitor driver input and issue a visual and audible alert if fatigue is sensed. Drift outside your lane without signaling and the available Lane Departure Warning System is designed to inform you with audible and visual cues. 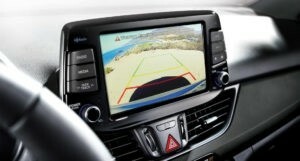 If no correction is made, the Lane Keeping Assistance component will engage and apply corrective steering assistance. 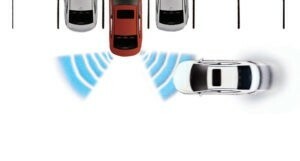 Activated when in reverse, the standard Rear Cross-Traffic Alert system uses radar to help identify and warn the driver of vehicles approaching from the side, even before they come into view of the available rearview camera. 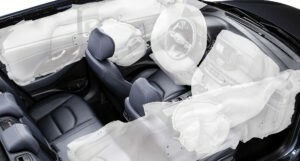 The all-new Elantra GT features seven standard airbags including a driver’s knee airbag for added protection. Whether you are pulling out from a narrow driveway or parking parallel in-between two cars, the standard rearview camera will help guide you. 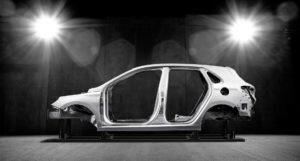 At the core of the Elantra GT is the SUPERSTRUCTURE™, a state-of-the-art platform that is the foundation of the Elantra lineup. Over half of the SUPERSTRUCTURE™ is comprised of our Advanced High Strength Steel for exceptional stiffness and strength and features an extended application of structural adhesives to reinforce critical areas. 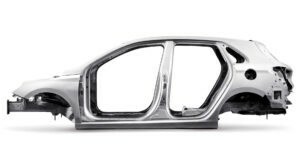 In the event of a collision, the SUPERSTRUCTURE™ helps protect occupants inside the vehicle by absorbing harmful energy and redirecting it away from the passenger compartment. 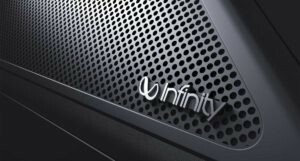 The available Infinity® audio system includes an external amplifier and 7-speakers strategically placed inside the cabin to provide an immersive, surround sound experience for all occupants. 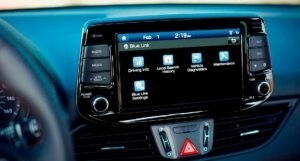 The all-new Elantra GT is the first Hyundai in Canada to feature BlueLink® – our available connected car solution that simplifies vehicle ownership. Access a suite of features with your smartphone or the in-car system to remotely lock, unlock or start your car, set the climate control to cool or heat up the interior, turn on the heated steering wheel, or find the closest gas station. In the event of an accident, it will even send an automatic collision notification and request assistance. The available wireless charging pad makes charging your compatible smartphone easy and cable-free. Just connect your compatible Android™ phone and you’re ready to go. Interact with Google™ services via voice recognition, make phone calls and receive messages, all while keeping your hands on the wheel. With Google Maps™, receive turn-by-turn directions, traffic conditions, estimated travel times and points of interest. 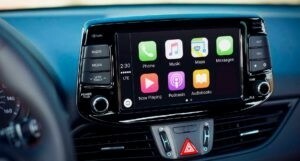 The Elantra GT offers Apple CarPlay™ connectivity, allowing you to connect your compatible iPhone and listen to Apple Music, get directions, call friends and more. 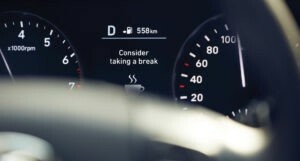 The available Adaptive Cruise Control (ACC) system takes basic cruise control to the next level of convenience. Set your pre-determined speed and distance to the vehicle ahead, and ACC will automatically adjust the vehicle speed to maintain this distance. The system will even operate in stop-and-go traffic, bringing the vehicle to a complete stop when necessary and then resuming automatically.